Eye Gaze technology may provide some people with disabilities with effective access to required communication and computer control functions where other methods prove too difficult or inefficient for them. Current commercially available systems consist of an eye tracking camera plus a software interface, which allows the person to bring their own computer hardware. Speech generating devices with integrated Eye Gaze units are also available. Eye Gaze is an Assistive Technology (AT) area that has undergone significant advances in recent years. Two current leading systems available in Australia are Tobii PCEye Go (manufactured by Tobii Technologies, Sweden) and Inteligaze CAM30NT (from Alea Technologies, Germany). Both are sold with advanced mouse control interaction and basic popup onscreen keyboards. When coupled with additional specialized and fully integrated software, these systems can offer increased independence with required communication and computer control functions. New mainstream eye tracking options are now available and have generated some interest online in Assistive Technology discussion forums. This interest has largely been due to the lower cost of the hardware. My Gaze is one of these and was shown at the Eurogamer Expo 2013 to positive reviews. 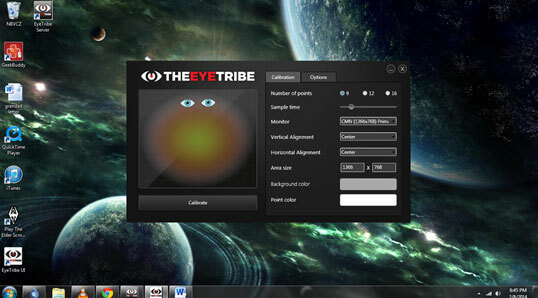 Q4 2013 saw the arrival of the Eye Tribe tracker (theeyetribe.com). Just last month, Tobii featured the Tobii Eye X at Las Vegas Consumer Electronics Show. Both Eye Tribe and Tobii Eye X are on the market as “developer release” and are available online for between US $100 -200. It needs to be stated clearly from the outset that the primary purpose of a developer release is to allow programmers to make their new and existing applications compatible with Eye Gaze access. These systems do not and should not be directly compared to fully -integrated assistive technology solutions as they lack the necessary features and setting adjustments that are normally required to make them work for a person with a disability. Both Tobii and Eye Tribe offer a software development (SDK) which allows developers to link the camera to their specific application. Both units ship with only limited support from the manufacturer. Eye Tribe have a user forum for developers and users to ask questions. At the time of writing there have been several questions asked and resolved. There are hardware and operating system requirements that must be satisfied. For example, the Eye Tribe tracker is USB 3 (usually a blue socket) connection only and operating systems below Windows 7 are not supported. However, there is hope for other OS support. 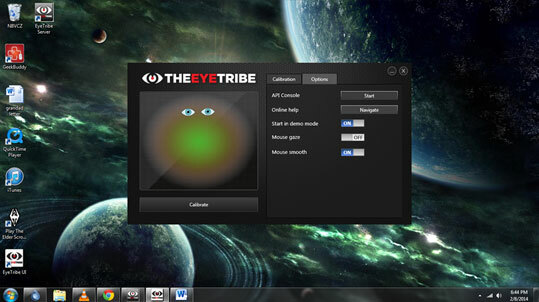 In 2013, Eye Tribe showed an earlier version of their system working on an Android tablet (You Tube) and their current promotional video demonstrates what appears to be Apple OSX functionality; and the Eye Tribe site states than an OSX SDK will be available in April 2014. To purchase a developer kit, you must agree to develop for the product in the licensing agreement. I purchased my Eye Tribe tracker with the intent of learning to code basic Windows applications. Microsoft Visual Studio has a free version and there are tutorials online for learning the programming languages supported. The Eye Tribe developer forum has links to one or two applications already made eye gaze compatible (Fruit Ninja being one). Eye tracking cameras are known to be subject to environmental effects. Chief among these are the level and direction of light in the room. Other known factors to consider when investigating eye gaze access include: user movement (head control), visual and perceptual skills, and level of intentionality to the task. This last sub-point is of particular interest among AT professionals and other team members, as at least some of the learning we have had in past few years has been directed towards the possibility of using Eye Gaze systems with people who may present with conditions resulting in an Intellectual Disability. As some people with ID have significant communication challenges, the standard methods for setting up systems (instruct the person to track a calibration plot around the screen and fixate on it until it moves on) may not be relevant. However, software developers such as Sensory Software have made programs such as Look to Learn that provide a series of engaging activities which grade up from the most basic (glance past the target) to more complex (choice making and built sequence of actions). A demo version is available with sample activities to explore. As noted elsewhere on this blog, it is also possible to use Clicker 6 with Eye Gaze access, as the program includes dwell click interaction (look at target and hold until the pre-set dwell time is achieved). Tobii’s Eye Gaze Learning Curve is an excellent model of how progression through this AT area might look; and provides resources (including video tutorials) and suggested activities. Software installation was simple and progressed with a hitch. It should be noted that the software does not appear to ship with an uninstaller utility. In mouse move mode, I found the tracking to be consistent across the both screens tested (17” widescreen and 13” widescreen). There was a mild amount of tracking shudder when I paused over targets. I used Sensory Software Dwell Clicker 2 to generate mouse click events. This worked effectively and I was able to select targets down to the usual 20mmx20mm level (this is an established threshold of accurate tracking for eye gaze technology). I also tested the tracking in mouse mode with both Tobii Communicator 4 Sono Key and The Grid 2 Fast Talker 2 pagesets set to dwell click and direct mouse selection. As the Eye Tribe tracker is new, it does not show up in the list of internally supported trackers for either program. At time of testing, the Eye Tribe tracker did not work with The Grid 2 on our machine. In conclusion, currently the Eye Tribe tracker is primarily of interest to technical people and hobbyists; and also for the potential of the business model (release to software developers) to drive innovation in making applications eye-gaze accessible. Crowd sourced funding, and the direct relationships with developers that are now possible because of social media, offer some degree of promise for new directions in Assistive Technology that may make it more accessible and affordable to people wishing to explore these options. David is an Occupational Therapist at ComTEC Yooralla, a Victorian statewide assistive technology advisory and information service. He assists people with disabilities and their teams to problem solve solutions in the areas of equipment for communication, computer access, mounting, and environmental control. David is also a Clinical Advisor to the Statewide Equipment Program in the area of Environmental Control Units; and has presented at local, national and international conferences. He is passionate about the potential of Assistive Technology to make a difference in the lives of people with disabilities. If you bought an Eye Tribe eye tracker, could you buy Dwell Clicker 2, and then pair them together? Thanks for the review of the eye tracker. Hi Jeff, apologies for the delay in getting back to you. The Eye Tribe Tracker will work with Dwell Clicker 2 (that’s what I used to test mouse functionality), however this is quite limited as an eye mousing system for someone with very limited movement for two main reasons 1/ the mouse control is not “auto-on” when the Eye Tribe server software starts (this means someone would have to switch it on each time) and 2/ Eye mousing is actually limited by the size of the targets being moused to. To my knowledge and experience of trying most of the systems out there, 20mmx20mm is considered to be the lower threshhold for items to be targeted reliably. This is due to the inherent limitations in the tracking hardware. Both of the specialist eye trackers (Tobii and Alea) have integrated Windows desktop interface software. This allows smaller targets to be zoomed and selected via a two step process, thus getting around the 2cm limitation and allowing for full Windows interaction right from when the computer starts. It’s a good idea to watch the Eye Tribe forum, as a developer may make a Windows interaction utility for their tracker; but until this happens, it’s not really easy to use as an eye mouse. Instead of magnification, could snapping help so that you might be able to skip a two-step process for some of the smaller targets?